Our most popular baby shower favors! 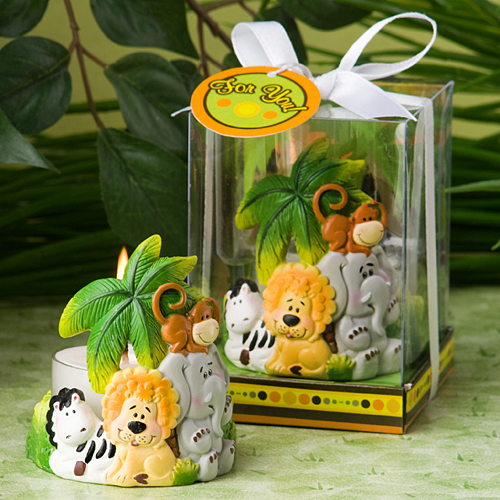 Perfect if you are hosting a jungle or safari animal shower, these candle holders (with candle inside) make adorable safari baby shower favors. They arrive gift packaged and ready to be given. Hand-painted resin holders that measure 2 1/2" x 1 3/4". Safari animals include a zebra, lion, elephant and monkey all against jungle backdrop. A round base with a clear tea light holder; a white tea light candle included. Packaged in a clear topped box with a jungle design base and background and then tied with a white satin ribbon and an attached round matching design “For You” tag. Please allow 5 business days to fulfill your order; then add ship time from NY.